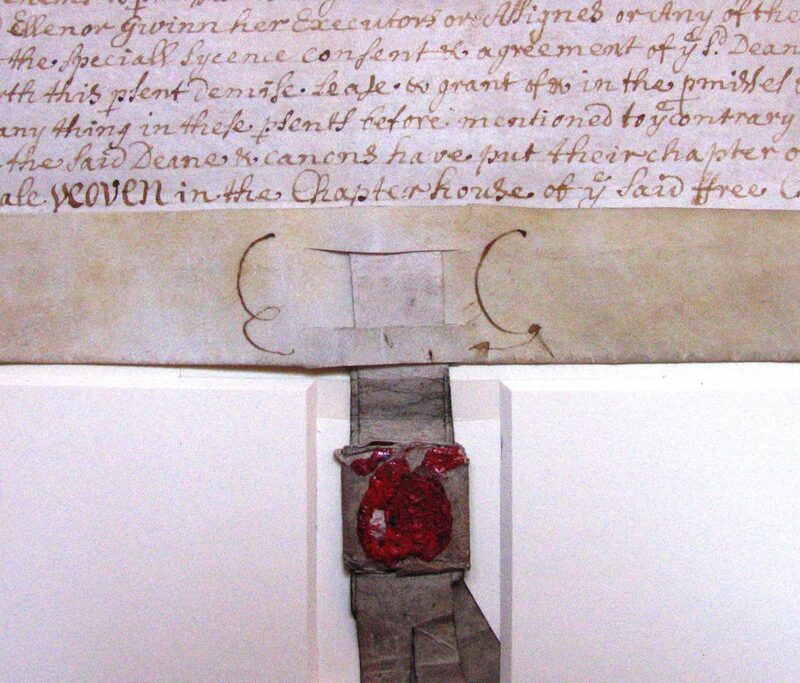 St George’s Chapel Archives holds three leases, all dated 11 December 1684, conveying land and property to Eleanor ‘Nell’ Gwyn (-1687), the notorious mistress of King Charles II. Through the indenture pictured [SGC XI.N.7], the Dean and Canons of St George’s Chapel leased a garden in New Windsor to ‘Ellenor Gwinn’ at a cost of 12 shillings annual rent. Through the two additional indentures [SGC XI.N.5-6,9] Gwyn leased nearby properties on Priest Street and at a place called ‘the old Hawes’, lying to the south of the King’s garden. The leases are signed E.G. and hold the seal of arms used by Gwyn. The tenements conveyed in these leases were but a few of the many properties leased and purchased for Nell Gwyn by the royal household. When these leases were signed in 1684, Gwyn already held the freehold for a house at the west end of Pall Mall and a lease for a summer residence at Bagnigge Wells House. The land and properties conveyed in the leases of 11 December 1684 were in fact intended as an enlargement of the property already leased by Gwyn in Windsor at Burford house. Gwyn’s properties at Windsor were situated at the back of the castle, meaning that they were conveniently located for rendezvous with the King.